Hope you all doing great. Today's post is an entry for a competition held by Money Supermarket. Nails are essential part of today's women beauty routine. Like any other fashion nail fashion is also evolved from simple red pink color nails to more decorated, bold and funky colored nails. Maintained nails doesn't only add a good factor to over all personality but gives confidence. As much as you like nail arts, its always a hectic and costly to go to a saloon and get your nails done. So why not do them yourself. Yeah it look a bit confusing with all those beautiful photos of nail arts around the internet. You may think from where to start, how and where to get those costly tools. So, why not create nail arts which can be made from tool available at home easily and are money smart too. This post has some tips n tricks and also simple step by step tutorials to get your nails done smartly. 1. For a good nail art, you should have good nails not in terms of length but in health. Give some time to your nails. Take care of them. There are so many treatments available if you have any kind of nail problem. 2. Invest in a good base coat, top coat and cuticle cream or oil. They may cost you few bucks but they actually will save your money. Cuticle creames make your cuticles moisturized and help them grow longer, base coat gives your nail strength and protect your nails from staining. Top coat is must for any nail art as well as for simply painted nails as they make your nails look shiny at the same time prevent your polish from chipping hence your manicure stay longer. 3. Always wear gloves when doing dishes or other works under running water. Too hot or too cold water affect your nails and cuticles badly. 4. Have a look around your house. 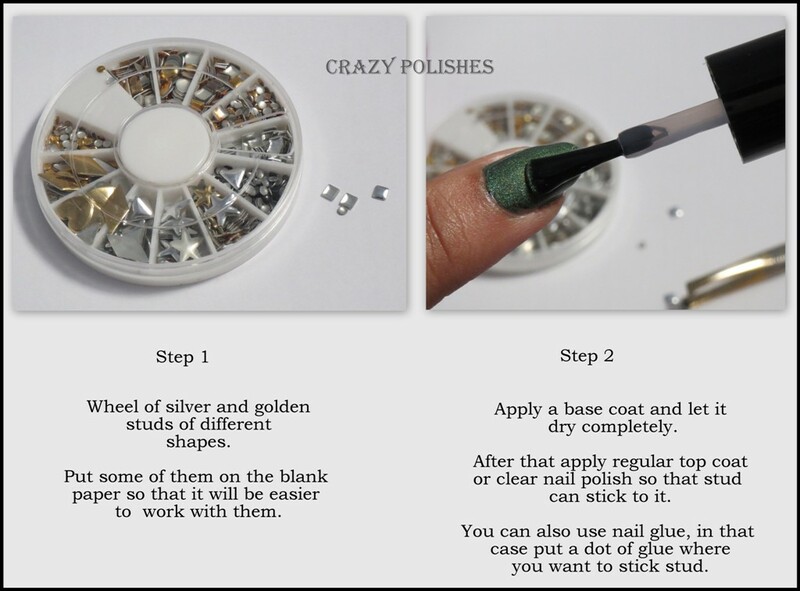 There are so many things which can help you create different nail designs. For example a bobby pin can be used to create a dot manicure. Art and craft feather can be used to create a beautiful feather nail art. At the same time a simple tea bag can help you fix a cracked/slightly broken nail. 5. Don't throw your old liquid eyeliner bottle. The brush can be used to create stripes. 7. Use your kid's acrylic paint and thin art brushes to create different designs. Yes the regular acrylic paints can be used to create different designs like flowers, faces , fruit almost everything that you can draw on canvas. Top coat seal the paint making is waterproof. 8. 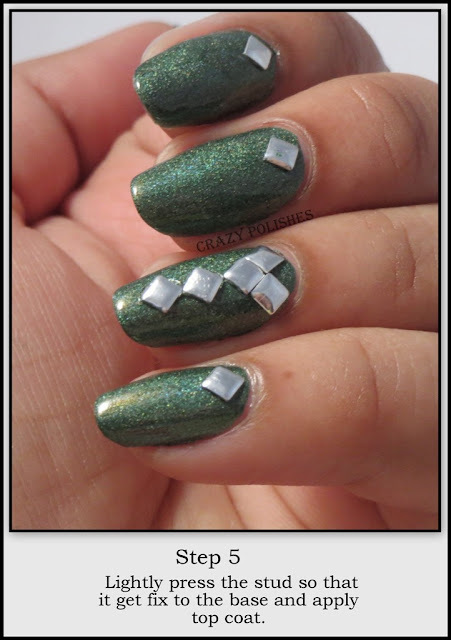 Paper reinforcements used to create half moon nail arts where scotch tape or mask tape used to create different type of nail tips like french tip , chevron tips(see tutorial below) as well as different designs like triangles, spikes etc. 9. Use Q-tips dipped in acetone for removing extra polish from cuticles and sides of nails. 10. Apply a thin layer of kids PVA glue before applying glitter polishes. You can peel off the base making removal easy. 11. Another way of removing glitter polishes is to use aluminum foil. Take some cotton, dip it in acetone and put on your nail. Now, take a small piece of foil and wrap it around your nail which is covered with cotton. Leave it for 5-10 minutes and after that remove both foil and cotton. All the glitter will be removed and transferred on cotton. 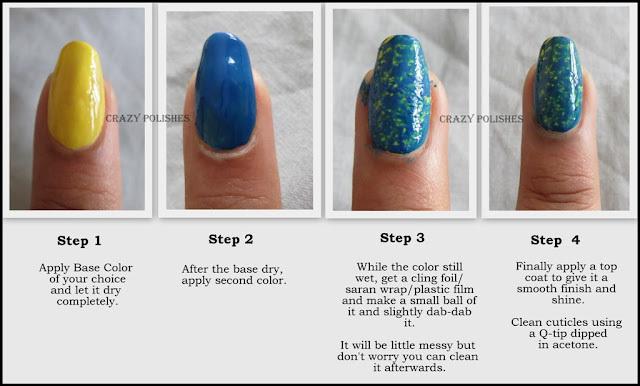 Nail Effect Polishes: easiest and quickest money saver nail art can be done using effect polishes like shatter nail polishes, croc effect polishes. Instruction are fairly simple and manicure can be done as lees than as 5 minutes. Nail Wraps/Water Decals/Nail Stickers: Today there are so many beautiful and pocket friendly nail wraps, water decals and nail stickers available. Use them to give your nails beautiful designs. Usually instructions of using them are clearly mentioned on the packs. Here's an example of cute hello kitty water decal. You can also draw leopard print, double dots etc. Apply base coat and apply base color. Let it dry. When the base is dry, cut the tape and place an end on nail as shown above. 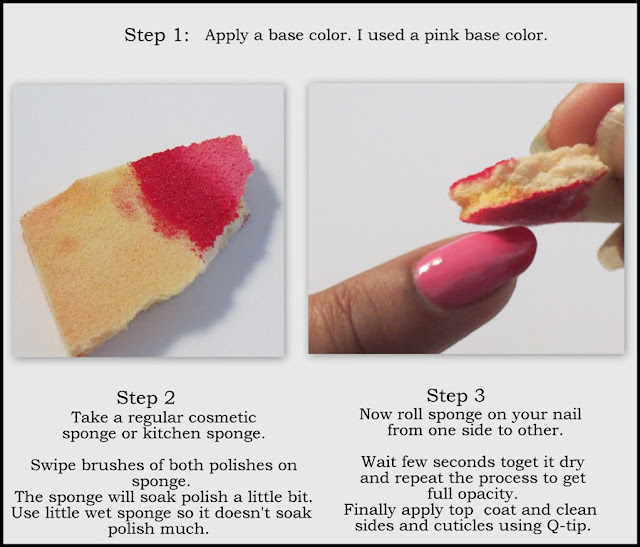 Apply second color on exposed area of the nail and remove the tape quickly. Let it dry and apply a top coat. Chevron tips are ready. You can create french tips by placing tape parallel to nail end. You can also use tape for designing different flags, spikes, creating triangles, diagonals etc. Pretty easy , isn't it. You can combine 2 or more technique to get even more cool effect. Like i created dots on my accent nail using bobby pin and white acrylic color. You can also cut tape in thin stripes and apply to your nail and then apply a dark blue polish and remove tape to create blue with pink and red stripe look. Nail Art Decorations like Rhinestones/Micro-beads/Studs/Sequins: There are many many many nail art decorations available in market for reasonable rates. These decoration comes in wheels, or in small packets. You can also create your own decoration like dried flower i mentioned in tips and tricks section. Using these decorations are easy you just need a regular top coat or clear nail polish or sometime nail glue(not necessary). Nail studs are latest fashion in nail decoration. Here are the steps about how to apply studs. In above picture i didn't apply top coat over complete look but it always helps them stick to their position when you apply top coat over them. You can apply rhinestones, sequins,glequins small acrylic pieces (needs nail glue to attach instead of top coat) like bows, hearts, hello kitty etc. in the same way mentioned above. For this look you will need a base color, 2 glitter polish one having medium glitters and another having fine glitters but its not necessary you can also use a single glitter polish. Apply base coat and then your base color. When the base dry, take your fine glitter polish and apply it on half of your nail in lightly dab dab manner. Let it dry a bit. take second glitter polish and dab dab it on tips of your nails. Let it also dry and apply generous amount of top coat to smooth out glitters. 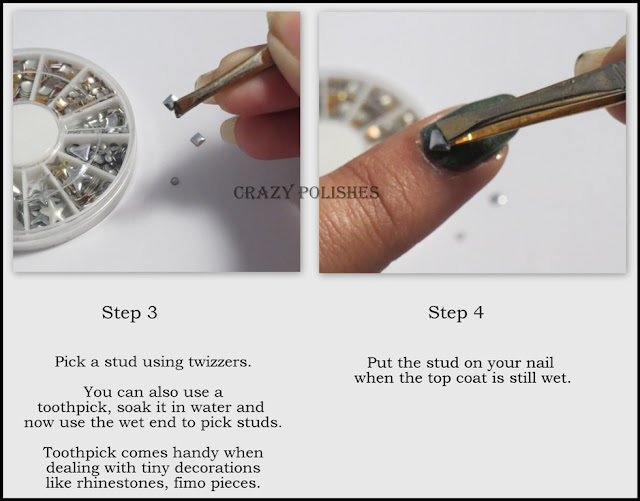 So, these are some money saving nail arts which can be created easily without any professional experience and expending too much. There are lots of more possibilities. Look online and believe me once you start creating your own nail arts at home, you will not head to nail saloons because every one loves whatever they create themselves and it feels really nice when somebody ask about your nails and you say i did it :)..
Hope you enjoyed reading it. If you liked any look and recreate it then please share them on my Facebook Page.